Everywhere I have travelled this last few weeks I have seen scorched earth, poor plants looking really sorry for themselves, and veg …some of which may have survived the lack of rain but have been eaten to death by Cabbage White and bugs. What a sad time for veg growers in allotments or garden veg plots. The dry and scorching heat and constant need for watering has taken its toll, both on the plants and the water meter!! 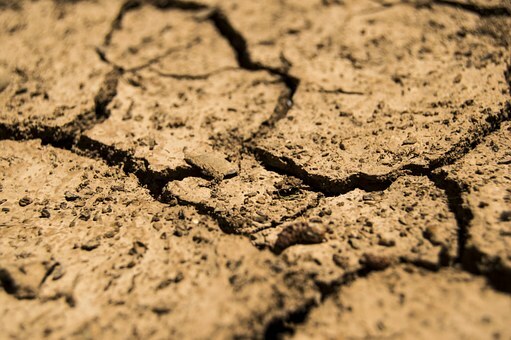 What a dreadful time for the farmers: Sky news announced “Mr Gove is meeting the National Farmers' Union in London as it holds an urgent meeting over "tinderbox" conditions that have dried out fields and reduced grass growth. 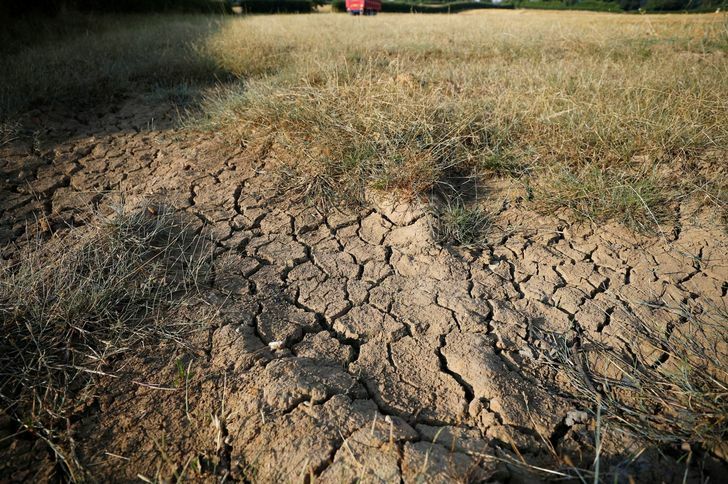 It has been the driest first half of the summer for more than 50 years and farmers say the "crippling impact" of a lack of rain has affected harvests. On the opposite side, although I tell you without trying to boast, our HydroVeg Kits are still providing copious amounts of fresh veg every day. 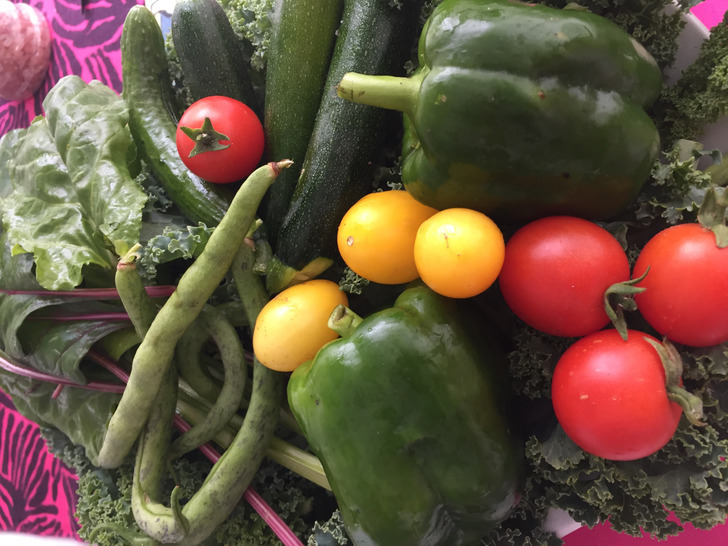 We have fabulous Tomatoes, Kale, Purple Sprouting Broccoli, Spinach galore, Courgettes, Chard and French Dwarf Beans and Peppers to pick fresh every day in our garden. Hydroponic gardens use 80% less water than conventional garden. As the water and minerals (nutrients) are constantly circulating they give the plants all the food and water they need – so they are truly flourishing. When we are watering plants in soil, most of the water dissipates, the ground is already hot, and the water really doesn’t get down to the little roots, so the plants are using their energy struggling for the food and water they need. On the large HydroVeg Kit which has 41 pots we have been putting more water in to top up the water box than normal in this really hot summer – this is true, but generally no more than 5-10 litres of water a day!! This would water 3-4 hanging baskets in a conventional garden or a few pots. CABBAGE WHITES AND THEIR OFFSPRING! That’s all well and good I hear you say…but what about the Cabbage Whites???? Well yes – they certainly come near but three things have helped us keep creatures and their offspring at bay!! Firstly we have sprayed the leaves of our cabbage, kale etc with garlic water. So chop up a garlic, and steep it in water for a while, sieve it and spray the leaves. We can see the white critters hover, but they think twice!! It hasn’t been 100% effective but at least 94% , which is better odds! Secondly as our HydroVeg Hydroponic gardens are vertical and off the floor, it is MUCH easier to see if there is a planting of little yellow eggs!! And then we see them we can easily remove them by rubbing the leaves with a bit of kitchen roll. I go out and look at the leaves every couple of days, It really is so much easier when they plants are at eye level, and I am not wallowing around on my knees. The Butterflies always lay their eggs on the underneath so that even harder in a soil based garden. Finally if we do get an occasional caterpillar, and I do mean occasional, I find that DiPel is the best remedy, it doesn’t harm the plant or other insects and pets.. nor us!! But it stops the caterpillar eating. This does two things…stops them eating your veg and secondly they starve. We bought ours from the internet. Its important that any remedy is not harmful on the plants to pets and humans, and this is the best way I have found in dealing with the product of the Cabbage White. The HydroVeg Kits is really coming into its own in the drought and hot summer, and I understand summers are getting more like this in years to come. That’s why we are developing HydroVeg Kits to provide food and save water in the developing world!! 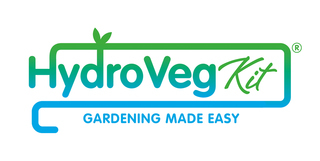 So why not look at HydroVeg Kits as the new way of growing veg in your garden 365 days a year, and saving water while you do it. Spring Greens yesteday in the HydroVeg Kit with chard, spinach and kale below. It’s the UK and the heat wave is still pushing on!! The grass is dead and brown. 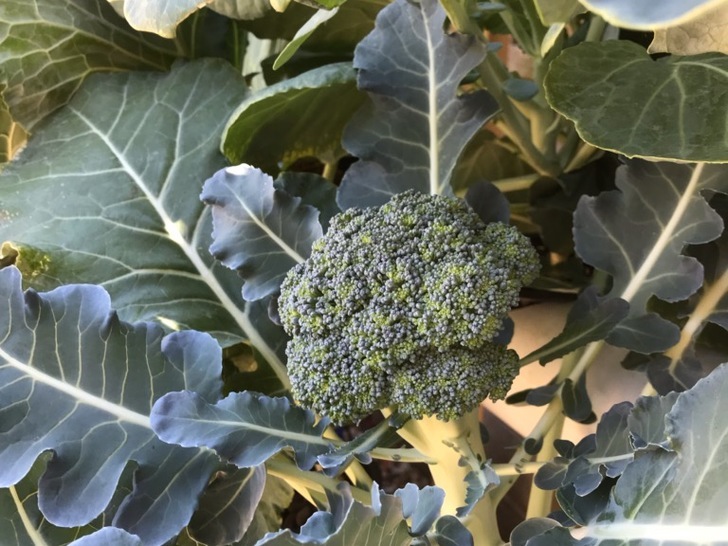 The garden needs more watering each night, and maybe in the morning too and the Jonathan Bucks of the Mail on Sunday ran an article this week on the fact that there will be a shortage of Broccoli and Cauliflower. David Simmons, from Riviera Produce, one of the country’s largest producers of broccoli said “We need a lot of rain and cooler conditions to keep these crops growing through the summer”. Well what has this got to do with HydroVeg…absolutely everything and nothing!! We help households grow their own veg 365 days a year outside with no digging, no weeding, no slugs and snails, no soil, taking up very little ground space AND VERY little watering!! The veg grows in water and minerals only which is circulating through the system all the time (well at least in the day.. as the plants sleep at night!). The plants get all the water, minerals and oxygen they need to grow quickly and healthily. 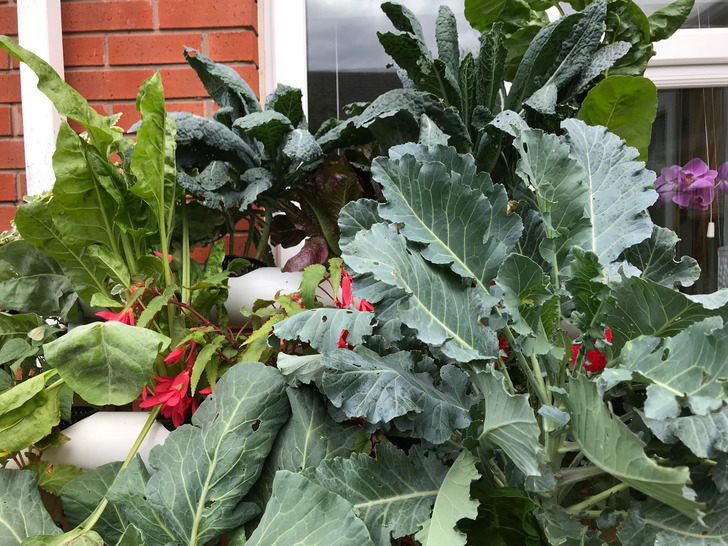 At this moment in our HydroVeg Kit we have Broccoli, Kale, Spinach, Chard, Spring Greens, Cabbage, Purple sprouting Broccoli, Courgettes, Aubergine, French Beans, Tomatoes and Peas all happily growing. So much so we are taking them to the Cotswold Show in the HydroVeg Kit on Saturday and Sunday. Hydroponic gardening has been around for thousands of years, back to the Romans, Greeks and Egyptians, but like all great things we loose sight of it. Well its back and living in gardens all over the country growing veg to pick and eat when you like. Watering the HydroVeg Kit is easy, the water is held in the water box at the side of the Kit with the minerals added, then it only needs to be topped up. In the steamy hot temperatures of this past few weeks we have averaged 5 -8 litres of water to sustain 41 very thirsty plants. That’s just over a watering can a day!! A watering can will only water about 2 hanging baskets in conventional gardens!! What about the winter….well as much as we are having a boiling summer, we also experienced a tough cold winter with temperatures reaching minus 12 degrees. 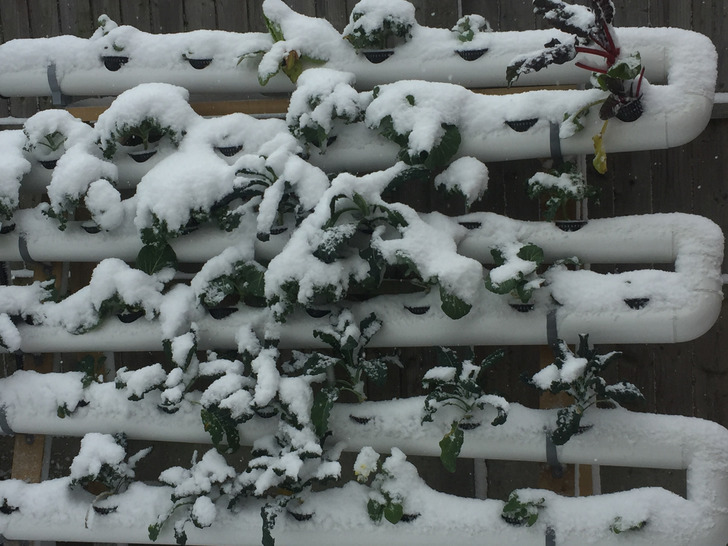 Well our HydroVeg Kit did freeze, but the plants were winter plants and would freeze in the ground anyway. They all survived and I was delighted to take a “Spring Green” plant with us to the Gardeners World and Good Food Show this June… which survived all through the winter into the summer. It’s still going, which is more than I can say for its friends – as we ate those!! I will be taking it to the Cotswold Show this weekend too! See it in the photo attached to this blog!! So winter, summer, what ever the weather throws at us there is still a great way to grow and eat your own VEG!! Many people think they can only eat specific parts of their greens, like the broccoli flower or the white cauliflower part itself. Are we discarding tasty greens when we prep our veg? In this blog, we will share with you our cooking top tips, and take a little look at what you can grow and eat at home. So no need to waste anything… believe me it’s all good for you.